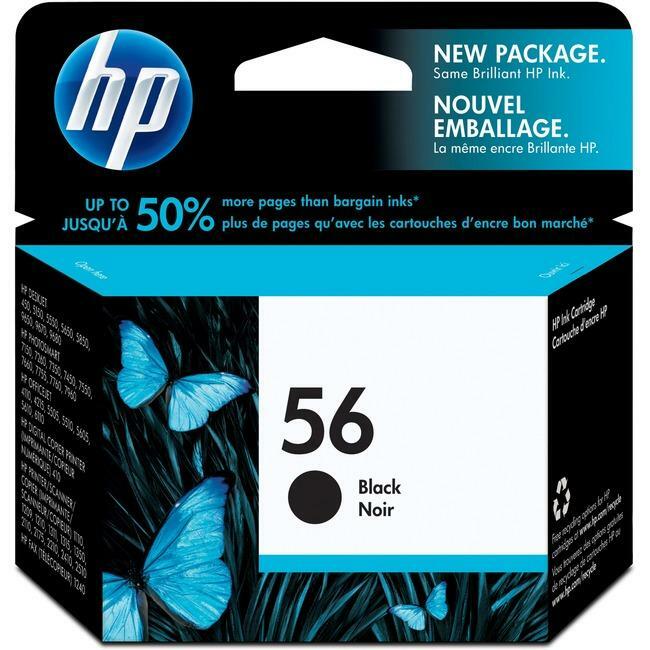 HP 56 black inkjet cartridge provides laser-quality black text for home users. Cartridge works as a complete printing system with HP 58 Photo Inkjet Print Cartridges, HP 57 Tri-color Inkjet Print Cartridges, and HP printers, papers and transparencies to deliver crisp, sharp laser-quality fade-resistant black text from pigment-based black ink. It is designed for use with Hewlett-Packard Deskjet 450CI/CBI, 5150/W, 5550, 5650/W, 5850/W, 9650, 9670, 9680; Officejet 4110/V/XI, 4215/V/XI, 5505, 5510/X/XI, 5605, 5610, 5510 Series, 6110/XI; Digital Copier 410; Fax 1240; Photosmart 7150/V, 7260V/W, 7350/V/W, 7450, 7550/V/W, 7600, 7660, 7760/V/W, 7960/W; PSC 1110, 1209, 1210/V/XI/A2L, 1311, 1315, 1350, 2110, 2175, 2410, 2410 Series and 2510 Series. Cartridge yields approximately 520 pages.